We are very grateful to have the involvement of our local Member of Parliament, Peter Heaton Jones, MP. Peter is an active supporter of our work, and has been involved in many ways, including unveiling art commissions for us, attending our exhibition and various events, and supporting us in our fundraising efforts. Thank you, Peter! We hugely appreciate the time you give to us, despite your really busy schedule. We would also like to say thank you to Mr David Hoare, his Office Manager, who is excellent at responding to all our emails. 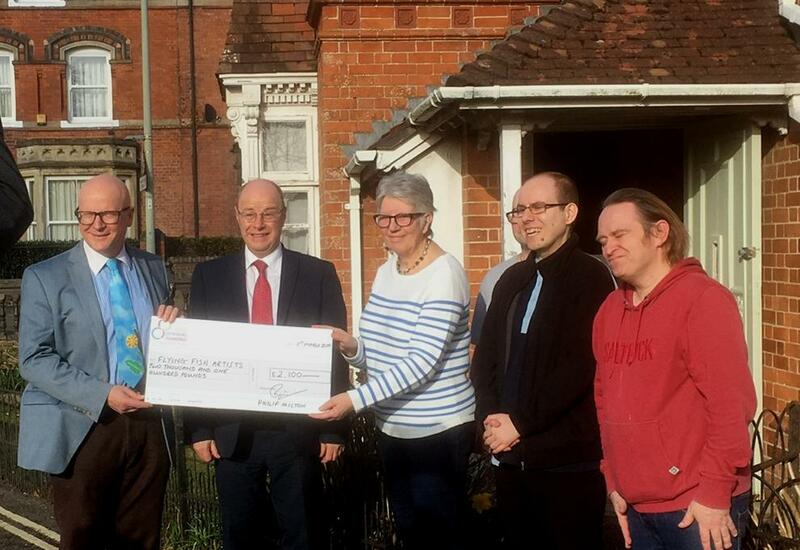 Photo above: Peter Heaton Jones, MP (second from left) with Philip Milton (left), a locally well known businessman who represents the Devon Community Foundation which generously donated £2100 towards art education for our members. With them (from right) are Bonny, Martin our Secretary, and two other members Edward and (another) Martin, behind. ​Photo right: Our Patron, Peter Heaton Jones MP, after he unveiled one of our murals in one of the NHS Mental Health Units in Barnstaple,.